I didn't want to go to Venice...no way. Now I've gotta tell you this. I didn't want to go to Venice...no way. I kind of believed it was old and grey, foul-smelling too. I didn't need no vacation to no place like that. Heck I've lived most of my life in Las Vegas and if anything gets old here it gets knocked down real quick. I sort of like that too. Bright, modern and clean. No history or culture but who cares, right? My wife twisted my arm and dragged me screaming and kicking with her for our thirtieth anniversary. Told me she had organized the top hotel in Venice Italy for us, told me that I'd have a good time...or else! You know what....she was right. Venice is old but heck it looks great just like it is – pretty much like me. I read on your website all about the water being sparkly and bright in the summer and I thought what a lot of xxxx. Well, sorry I thought that. You were right so accept my apology. Same thing when my wife told me we were heading for the best hotel in Venice I thought...big deal! What could they have that we don't have right here in Vegas? Answer to that is great taste, real style and a classiness you just aren't ever going to see in Vegas. Anyone from the States reading this and not sure about Venice? Well let me tell you to get off your couch and get going. 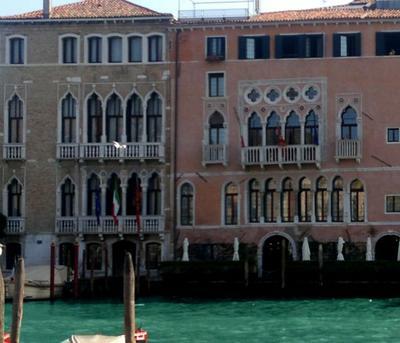 You'll want to check into that hotel I stayed at too, it's the Pesaro Palace Hotel . Maria's reply: Thanks Nico, I really enjoyed your submission. It was so very honest. I don't think I've ever read one quite so to the point. It just goes to prove how Venice is capable of capturing any heart - no matter how cynical or jaded.